‘A bakewell tart (maximum tin 8″)’ is one competition section in this years local show, so I though I’d give it a go and enter. We went to Bakewell, the town itself, a couple of years ago on a weekend trip and tried the Bakewell Tart there but it was most definitely a pudding rather what I would class a tart so that wouldn’t do for the show, though it was very nice. In fact, delving into the history reveals that today’s frangipan and jam filled tart bears no resemblance to puddings of olde that had custard and candied fruit as the filling of a puff pastry case. I used the Queen of baking’s (i.e. Mary Berry) recipe as a guide and tried to steer clear of any Kiplings cakes resemblance. 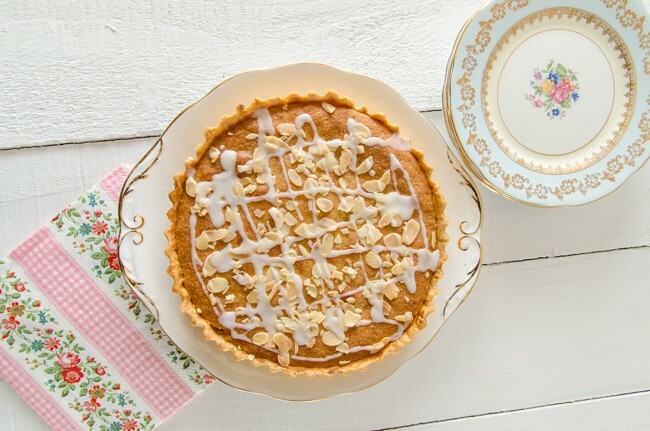 I am please with how my initial Bakewell tart turned out so I decided to go with this recipe for the show. I will have to make it 48 hours in advance so finger crossed it doesn’t go soggy! 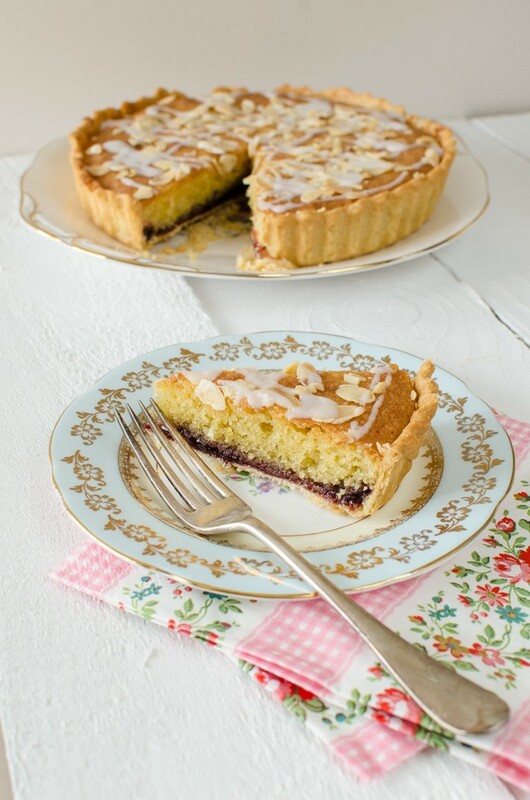 The pastry was lovely and thin and crisp, plenty of jam so you could tell what flavour it was and the frangipan was a dense sponge with a lovely almond flavour without being too heavy. Hope the judges agree! I will find out in just a few hours so will post an update then! 9/9/14 – update – it got first in the show so the recipe can’t be too bad! Roll out the dough on a lightly floured surface and use to line an 8″/20cm loose bottom flan/tart tin. Use the left over pastry to line a couple of deep individual tins. Make sure the pastry is right up to the corners and trim the edge carefully and prick the base all over with a fork. Put in the fridge to chill for 30 minutes. Preheat the oven to 200 ºC/180 ºC fan. Line the pastry cases with baking parchment and fill with baking beans. Blind bake for 15 minutes (probably 10 minutes for the individual tarts) then remove the beans and paper and return to the oven for another 5 minutes until the base is cooked through but the edges are not coloured too much. Take the tarts out of the oven and allow to cool. Turn the oven down to 180 ºC/fan 160 ºC. Make the filling by whisking the butter and sugar until creamed then add the flavourings to the eggs and add all the remaining filling ingredients except the jam and flaked almonds. Fold together until well mixed. Spread jam generously over the base of the pastry tarts – I used about half a jar on the big tart. Top the jam with the frangipan and spread until smooth and the frangipan is right up to the pastry edge and level with it. Sprinkle over the flaked almonds. Place on a baking tray in the preheated oven for 30-35 minutes, turning a couple of times so it colours evenly. If it is colouring too much then loosely cover with foil. Leave to cool in the tin for 10-15 minutes then finish cooling on a cooling wrack. Decorate with white icing if wished (icing sugar with enough water or lemon juice to make a pouring consistency).